Standing guard over the Solway Firth like a silent sentry, Caerlaverock Castle is an impressive landmark in the Nithsdale countryside. With its moat, two-towered gatehouse, and imposing battlements, it is the epitome of the medieval stronghold. The castle's turbulent history owes much to its proximity to England which brought it into border conflicts. 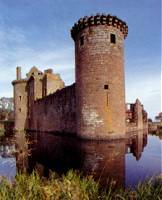 The Maxwell family, who built Caerlaverock, enjoyed peaceful prosperity there until the invasion by Edward I. The castle became a target for Edward's wrath against Scots resistance and in 1300, Lord Maxwell's garrison was forced to surrender to the overwhelming might of the besieging army. During the 16th century Caerlaverock featured in Anglo-Saxon conflict until James VI's accession to the English throne brought peace to the Borders for the first time in centuries. The truce collapsed with the 1640 Civil War and the final siege at Caerlaverock came when the Royalists surrendered to the Covenanters. The castle fell into ruins but it still remains one of Scotland's finest. Today visitors can enjoy a siege warfare exhibition, a children's adventure park and a nature trail. The Castle is connected by foot path to the adjacent National Nature Reserve. The shop features a range of local products made in Dumfries and Galloway. Cafe open during the summer. Seven miles south south east of Dumfries on the B725.